Whomp whomp. There're no American Depresses for sale. Pop iconoclast Ron English presents the ultimate black vinyl fetish item – American Depress. A three dimensional depiction of America's Bloated Billionaire Mouse Messiah is crucified upon the mousetrap status symbol of American capitalism: the Black Card. Ron English reinvents imagery from modern popular culture, manipulating visual symbols to create complex, humorous, and insightful meanings. For American Depress, the urban pop prankster has focused on a beloved character happily entrapped by the consumerism that has made him. 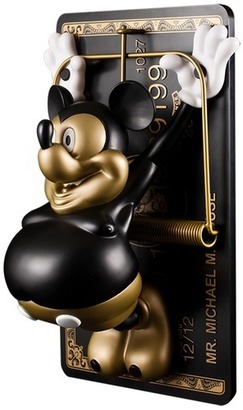 The over-stuffed mouse is splayed on a 12-inch tall sheet of black ABS, embellished with gold printing. The card numbers reference the beginning of the royal rodent’s reign, and, a very short time after, the darkest hour in the history of the American economy. From there both iconic rodent and consumer grow to obesity until the card’s expiration date - the day of the foretold apocalypse. Fitted with an indent on the back, this modern relic is built to be hung over all we devour. Typical of the culture this mash-up of feigned innocence and greed represents, American Depress is available for purchase at the right price and limited to the persistent and the lucky. Each of the 200 pieces in this edition is hand numbered, with the artist’s signature engraved on the back.